Caiping Lin is a Doctor of Chinese Medicine educated and trained in China. She holds a 5-year medical degree from Zhejiang College of Traditional Chinese Medicine, listed by the World Health Organization, eligible for United States Medical Licensing Exam, and recognized by Educational Commission for Foreign Medical Graduate as M.D. equivalency in the U.S.A. She is a licensed acupuncturist in Pennsylvania and New Jersey, certified in both U.S.A. and China. Lin worked for 7 years practicing herbal medicine and acupuncture at Wenzhou Hospital of Traditional Chinese Medicine, Zhejiang Province, China, treated over 10,000 patients with Chinese herb formulas, acupuncture, Qi Gong acupressure, auricular therapy, cupping, moxibustion, and other Oriental healing arts. She taught 9 clinical trainees and published 4 papers on Chinese medicine. 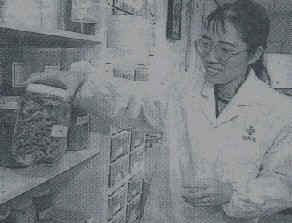 In addition to formal medical training, Lin learned directly from some famous senior practitioners of Chinese medicine. From wide sources she studied experimental and special herbal formulas, both modern and ancient. By applying what she has gained from the earlier treasure, Lin often has effective results helping conditions such as chronic pain (sciatica, neck, back, knee, shingles, etc..), allergy, depression/anxiety, insomnia, fatigue, and digestive issues (diarrhea, acid reflux). She has rich experience in women's disorders, infertility, menopausal syndrome, pediatric disorders of respiratory and digestive systems, and urethral dysfunction ( I.C., urinary retention). The remarkable healing effects and her undisputable professional ethics make Lin very popular among her clients, and most people come to her for Oriental therapies by word of mouth. Lin has extensively studied and practiced Tai Chi and Qi Gong since her teens. She has gained much experience and insight to the close relationship between Tai Chi, Qi Gong, and Chinese Medicine, especially the way in which they relate to the Meridians in the body. The popularity of Lin's Yang style Tai Chi classes comes as no surprise. Her knowledge and ability is transferred to her students, thus many choose to follow and take her class several times.